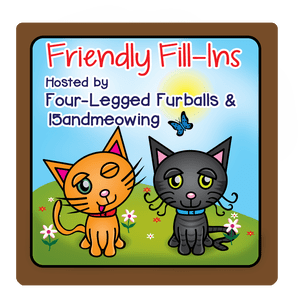 It’s Friday and time for Friday Fill ya Ins with our co-hosts 15 and Meowing and Four Legged Furballs. Simply click on the badge and be taken to pictures of your friends. Click on their pictures and be taken to their blog. It’s like sci-fi! Budd will do the first 2 sentences and Shoko will do the last two. 1. A…..FRIEND….. will…..LIGHTEN YOUR LOAD BY MAKING SURE YOU HAVE FUN. Shoko’ll never find me here behind the bush. 2. 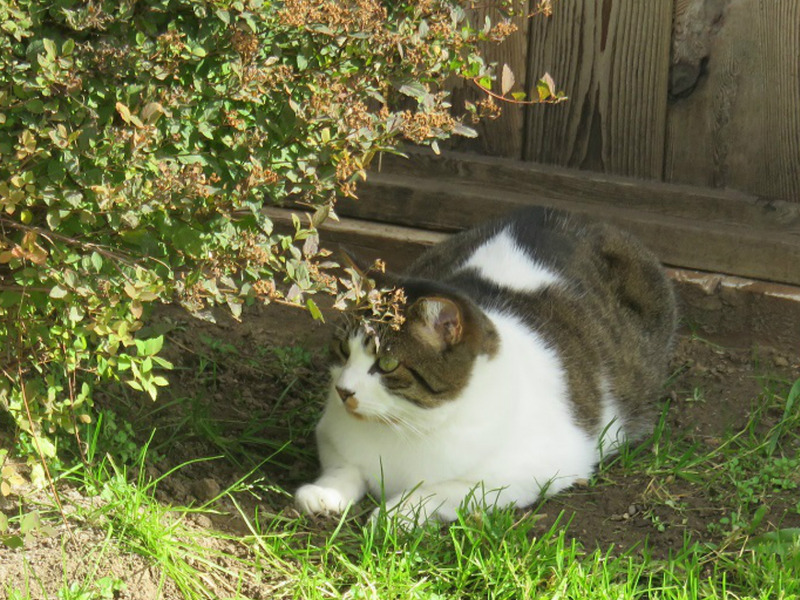 The best time of the day is…..AFTERNOON…..THE SUN IS OUT AND IT’S WARM IN THE BACKYARD. 3. PATIENCE….. is not my strong suit. Are you two hidden yet? I wanna have a dirt bath! 4. It’s all fun and games until….SOMEONE GETS EXCITED AND FALLS OFF THE DECK. NOT MENTIONING ANY NAMES. That only happened a few times, Shokos. This entry was posted in Uncategorized and tagged badge, bath, Budd, bush, deck, friend, sis, suit, sun, times on September 28, 2018 by The Canadian Cats. 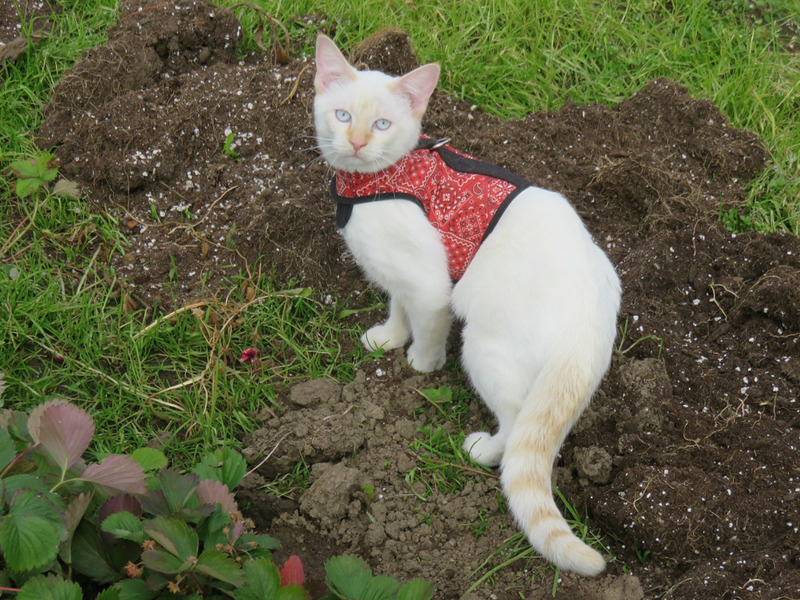 After all the work of preparing the garden for the next season is done, add one garden cat – or two or three – to make it a true garden. That’s my motto! I use to try and prepare the garden for next year but as I get older, just to know this season is finished and the freezing and canning is done is enough. 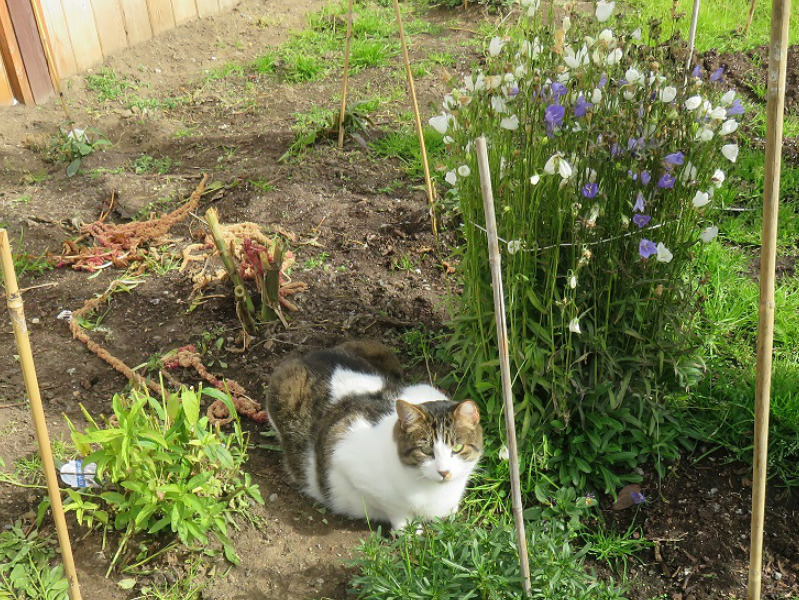 There are weeds galore in the garden but they’ll have to wait for Spring now. 3 cats in the garden is enough for me. I can’t garden as much as used to either. Of course, where I live no doesn’t have the rich, loamy soil I built up where I used to live, and the effort that took is beyond my capabilities now! I used to allow the weeds to grow in my garden on the premise that they provided extra food for critters that otherwise ate my garden plants, and it worked! Plus, I put lawn trimmings and other yard waste leaves, that sort of thing, on top of weeds growing in my paths through the rows. I used techniques I learned from Organic Gardening, and was well rewarded for using non-chemical means of improving my soil and plants. You three have a lot of fun in that yard of yours – the remains of the garden give you great spots to hide behind…….and Tyebe – you’d better be careful walking on that “tightrope” railing – falling sometimes isn’t FUN on that hard ground!!! Yes, Lucy and Xena me’s has fallen off the deck 4 times now. 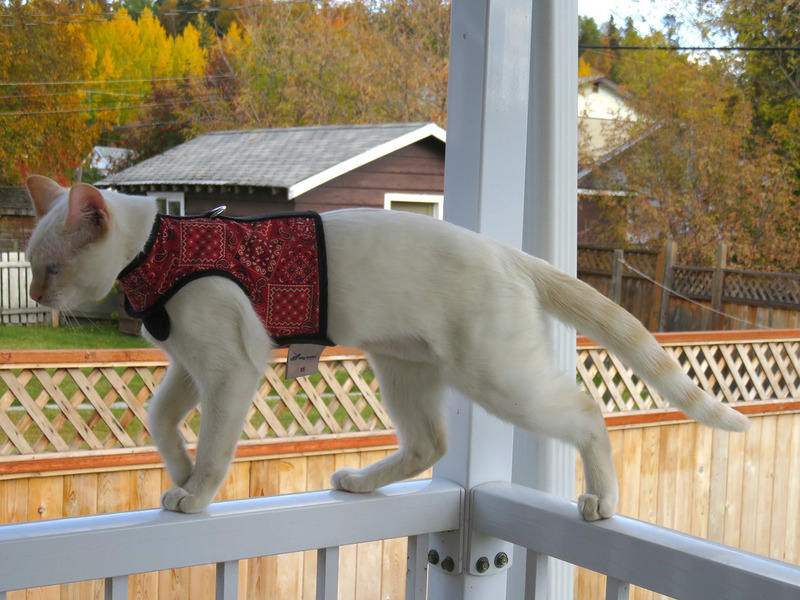 Once I’s ran through the bars of the deck and there was no floor on the other side! Yep, Budd and me’s were playing, “Hide and Seek.” Shoko started to play but hissed everytime we found her. We wish we could have seen that! Cats only have patience when they are waiting at a mousehole! 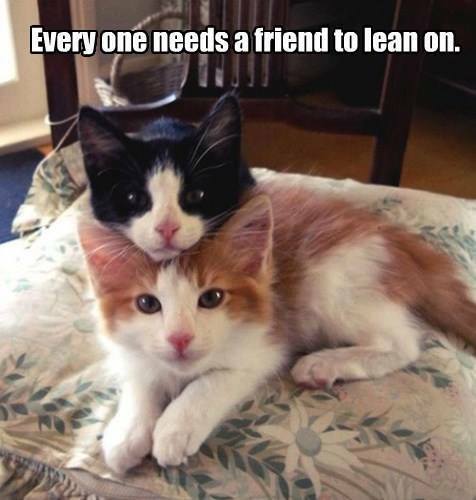 Kitties always do these so very well and your sure did. I agree the cats seem to know just the right thing to say. Great Fill in friends. Thank goodness cats land on their paws when the fall. Thank you. We try hard. I’s been lucky and always landed on paws. Me’s have big pawws so I’s stable when me’s land. We finally joined the blog hop with the others. I’m with you, B. I love sunny sunshine in the afternoons. That’s usually when Mom and I go to the park for a walk. It’s so warm and cozy…I drift off for 40 winks in the sun. I’m showing Tyebe how to relax in the sun. She’s just too busy for her own good. You have to be more careful, Tyebe. You don’t want to keep falling off the deck or they will be calling you Flyebe! Hi there fishy friends. How’s the yungun’? Thank you for sharing your Friday Fill-in answers. Sounds like a lovely afternoon when the sun is out shining and it’s nice and warm to relax in the backyard. Tyebe, we hope you don’t fall off the deck anymore. Great seeing such lovely photos. Have a wonderful weekend..
I’s trying to walk through the bars and still stay on the floor….it’s hard. Heh, heh, The Tribe of Five have had a few “falling” incidents. Not fun at all! Me’s love to hear of others that have “fall down” accidents. You all look so happy there…Budd great hidin spot! Shoko yore wondnerfull. And Tyebee maybee you wanted to step off thee railin rite??? Meow meow meow…..
BellaD we sure liked the sun and sunnin’ around in the backyard. Mee was out inn Condo this mornin an it was sunny an nice. Then it went are grey an scarey an rain poured down! An it keeps doin that Shoko! Fishfingurrss! So mee stay inn-side today…. 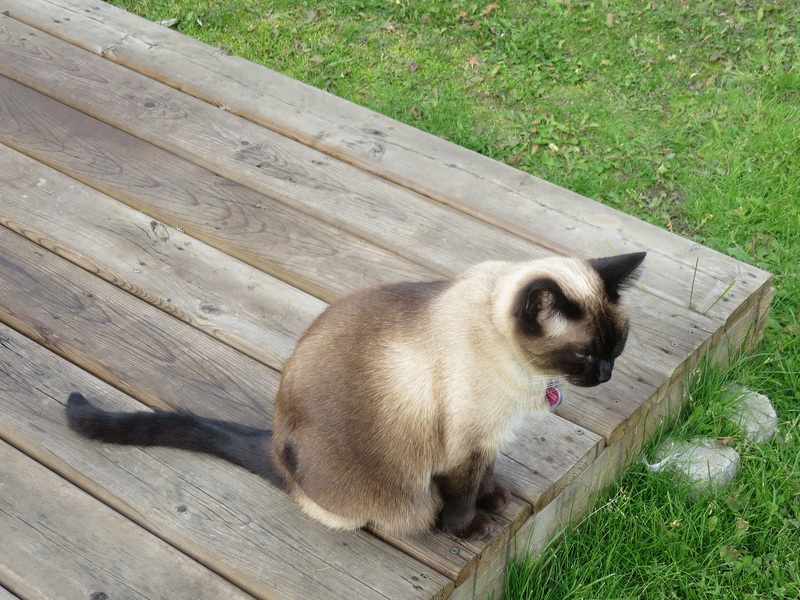 Hmmm…now who could’ve fallen off the deck? MOL! It’s hard to say who fell off the deck but me’s will give you’se a hint….it wasn’t Budd. Thank you for joining in on the Friendly Fill-Ins! I think a lot of us here agree that patience can be such a difficult thing. Especially kitties, because kitties should get what they want and when they want it!